One wants a room with no view, so imagination and memory can meet in the dark. TYPOLOGY is pleased to present our inaugural exhibition, ERRATIC ROOM. Featuring an immersive video installation and new limited edition photo series by Lyla Rye, Erratic Room is an exploration into spatial perception and its often hidden physical and psychological effects. Throughout human history, dark rooms have occupied a spectral presence in our imagination and memory, and even in today’s brilliantly illuminated world we continue to spend a significant portion of our lives within them. From the theatre to the bedroom, we enter or invest these anomalous spaces with feelings of anticipation, trepidation, fantasy or fear. In the dark, where space becomes boundless and untenable, our most imaginative selves take centre stage, enacting our innermost desires and deepest dread. Featuring altered projections of architectural and urban apertures, enclosures, edges and experiences, Erratic Room’s imagery constitutes an off-kilter vision of the world just beyond our walls. Out-of-sync sounds, unmoored from the images and actions they originally corresponded to, reverberate with an echo or foreshadowing of past and future uncertain events. Simultaneously delimiting and expanding the boundaries of the space it occupies, Erratic Room begets a similarly confounding effect upon our imaginations and memories. From our cloistered vantage point within the darkened room, the enveloping projections assume the form and function of apparitional windows on an unsettled world. The Erratic Room Print Series is the physical embodiment of the ideas Rye explores in the ephemeral installation. Conceived as a sculptural photo edition, the series features four light-filled moments from the Erratic Room projection sequence, each of which has been carefully selected, printed, and mounted between curved supports within a custom wood box frame. Like the installation, the edition hovers between two and three dimensions, playing with the viewer’s spatial perception in its warping of both image and support. Printed on glossy fine art paper, the works are highly reflective and responsive to ambient light and the surrounding environment in a way that makes them truly site-specific: the constantly changing reflections and shadows playing across the photographic surfaces are considered by the artist to be integral to the images. 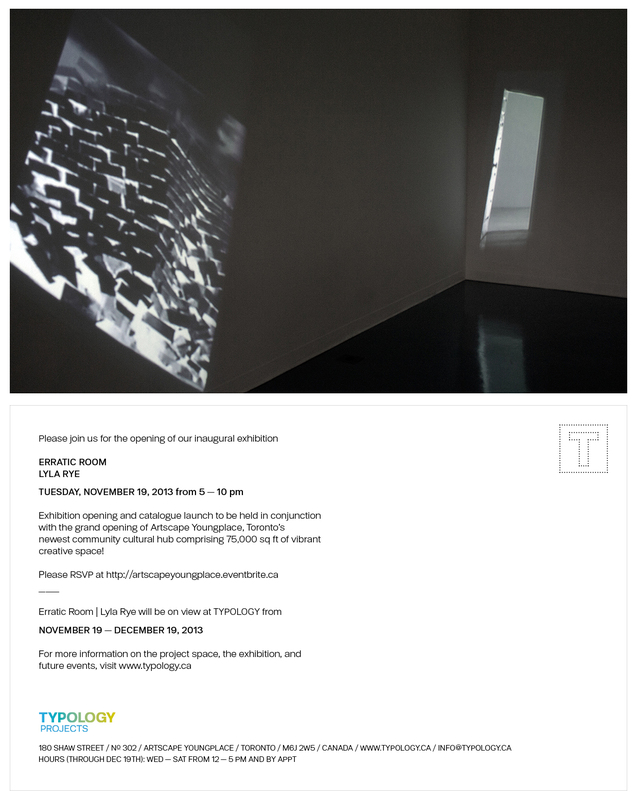 The Erratic Room | Lyla Rye exhibition opening and catalogue launch will take place at TYPOLOGY in conjunction with the grand opening of Artscape Youngplace, Toronto’s newest community cultural hub. For information on this and future exhibition-related events, please see Event listing below. Images and info on the Erratic Room catalogue, photo series, and limited edition print (first in a series produced by TYPOLOGY), will be posted soon. Critical Distance Centre for Curators (CDCC) was founded in 2013 under our former name, TYPOLOGY. Established as a not-for-profit space devoted to curatorial and artistic experimentation, we devoted our first three years to providing opportunities for curators and artists to mount fully realized exhibitions within a critical framework. In 2016, we relaunched under our new name (CDCC) with a new Board of Directors and a commitment to meet the need, voiced by local and national curators, for a truly vital curatorial community—one that both supports emerging and underrepresented curators, and advances curatorial practice and inquiry. Erratic Room took place in CDCC’s exhibition space in 2013 under our former name, TYPOLOGY, and was curated by CDCC’s Founding Director, Shani K Parsons. Erratic Room, curated by Shani K Parsons, installation view with work by Lyla Rye, TYPOLOGY Projects, 2013. Lyla Rye, Erratic Room (window), 2013, archival inkjet print on Ilford Smooth Gloss paper, curved support, wood, 14 x 14 x 2 inches, edition of 3; Erratic Room (stairway), 2013, archival inkjet print on Ilford Smooth Gloss paper, curved support, wood, 14 x 14 x 2 inches, edition of 3; Erratic Room (doorway), 2013, archival inkjet print on Ilford Smooth Gloss paper, curved support, wood, 14 x 14 x 2 inches, edition of 3; Erratic Room (gate), 2013, archival inkjet print on Ilford Smooth Gloss paper, curved support, wood, 14 x 14 x 2 inches, edition of 3, in Erratic Room, curated by Shani K Parsons, TYPOLOGY Projects, 2013. Lyla Rye, Erratic Room, 2013, (installation view), installation with 2-channel video projection (DVD), mirror apparatus, stereo audio, duration and dimensions variable, in Erratic Room, curated by Shani K Parsons, TYPOLOGY Projects, 2013. Lyla Rye, Erratic Room, exhibition catalogue and limited edition archival digital print, both produced at a size of 6 x 9 inches and in an edition of 25 copies, signed and numbered by the artist, from Erratic Room, curated by Shani K Parsons, TYPOLOGY Projects, 2013. Lyla Rye, Erratic Room, exhibition catalogue, 6 x 9 inches, edition of 25, signed and numbered by the artist, from Erratic Room, curated by Shani K Parsons, TYPOLOGY Projects, 2013.